SUMMER SESSION - REGISTER NOW! Learn More About our upcoming workshops! 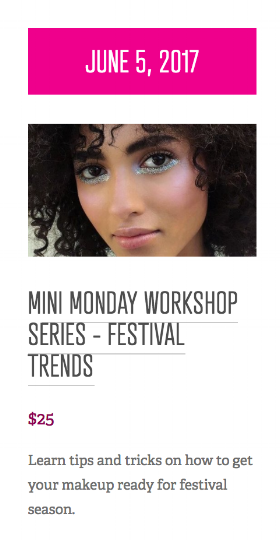 Our FIRST session of our 'Mini Monday Workshop Series' begins June 5th, 2017. Once a month we will offer a demo-based 2 hour workshop open to the public! Each month will have a different theme, so check them all out with the link below! Jordan Liberty is coming to Make Up First®!